CWA President Chris Shelton testified on Wednesday before the U.S. House Ways and Means Committee at a hearing examining how the promises Republican leaders and corporations made on job creation and raising wages have not been fulfilled after the passage of the tax bill. 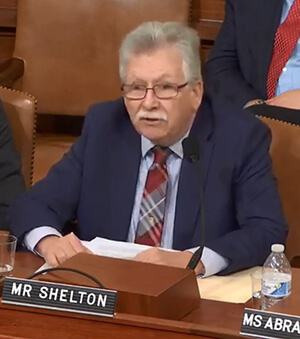 "One need look no further than our experience at AT&T for a prime example of how those promises have not become reality," Shelton told Congress. "AT&T CEO Randall Stephenson was one of the most visible and aggressive supporters of the corporate tax cuts. In his public statements in the media and to employees, he promised that AT&T would create at least 7,000 new jobs if the tax cuts were to become law. Instead, since December of 2017 when the tax law was passed by Congress and signed by the President, AT&T has eliminated 12,321 union jobs." In advance of the hearing, CWA released a new analysis suggesting that after refunds, AT&T paid no cash income taxes in 2018 and slashed capital investments by $1.4 billion. Shelton brought with him hundreds of hand-written letters that CWA members who work at AT&T had written to members of the Committee and read from some of them at the hearing. Representative Dan Kildee (D-Mich.) noted that he had met with CWA members in Flint, Mich., and received thousands of letters. "Unless the focus is on how we strengthen the American worker, and not how we reward those people at the top who are already doing quite well, we are going to see more [layoffs]. This Tax Cuts and Jobs Act was a jobs cut and tax act." Kildee said. Shelton pointed out that AT&T is not the only employer that has not shared the benefits of its tax windfall with its employees, citing General Motors, American Airlines, and Wells Fargo as other corporations benefiting from tax cuts while under-investing in employees and cutting jobs. He urged Congress to call for AT&T CEO Randall Stephenson and other corporate executives to testify and explain exactly what they did with their tax windfall and what is really behind the job cuts. Watch President Shelton's testimony here.